After two non-biking days it feels good to be back on the saddle again. It seems I’m becoming a cyclist, after all. We leave the hometown of Confucius quite early and in high spirits, planning on a noodle brunch somewhere on the way. Volker has mapped a route of side-roads that should bring us to Tai’an and the sacred Mt. Tai. On the way out of town a tuk-tuk starts stalking us. The driver follows us closely behind, then overtakes us and slows down in front of us, after we manage to overtake him he speeds again and drives parallel to us. We reach the side road we are supposed to take, and turn. “No, you can’t go there!” – shouts the tuk-tuk driver to us in English. “Where do you go? To Tai’an? – it is here, here.” And he gesticulates towards the interstate which we are just leaving. “I know,” says Volker – “but we want another one!” And on we go, with the tuk-tuk left behind. After a kilometre or two I have a déjà-vu – the occasional cars or motorbikes coming against us seem strangely familiar, as if I have just seen them, but in the other direction. Soon I know why – Road works! And not the Jiangsu-type of road works, when the road is already finished, merely with an earthen barrier at the end of the repaired stretch remaining, but a construction in full swing. No way to make it through! We return to the interstate, and bike on to the next possible exit which will bring us onto the right track. The beginning looks good – some traffic, some villages – and then we reach the road we are supposed to take – or, rather, the place where the road used to be. Road works! To the left and right all that is left is a pitch with baggers, bulldozers and piles of sand, stretching into the distance. What now? To turn back to the interstate? After so many kilometres simply go back to the point where we were hour and a half ago? No, we go forward! We brace ourselves, quickly descend into the sandy pitch and somehow manage to bike out of it onto the other side. We are ready to start on, when two friendly locals on a motorbike approach us. The dialogue from the morning repeats itself. “To Tai’an? – No, you can’t go here, you should go back, to the interstate”. “Never listen to these people!”, declares Volker – “they always direct you to the main road!” After our experience with the previous road construction I am quite inclined to listen to them. “The road looks OK to me!”- insists Volker, pointing to the cars and motorbikes going in this direction. Our argument grows, our voices rise, and the two villagers leave us to our own device. After a complicated manoeuvre on the narrow road we manage to turn our vehicle back – only to realise that there is no turning back. A truck has just unloaded a fresh batch of sand exactly where we passed 15 minutes ago, making our way back through the pitch impossible. Being left without a choice calms down the passions, and on we go, family peace restored. The motorbikes and tuk-tuks grow more and more numerous and suddenly we are jammed in the middle of a market. 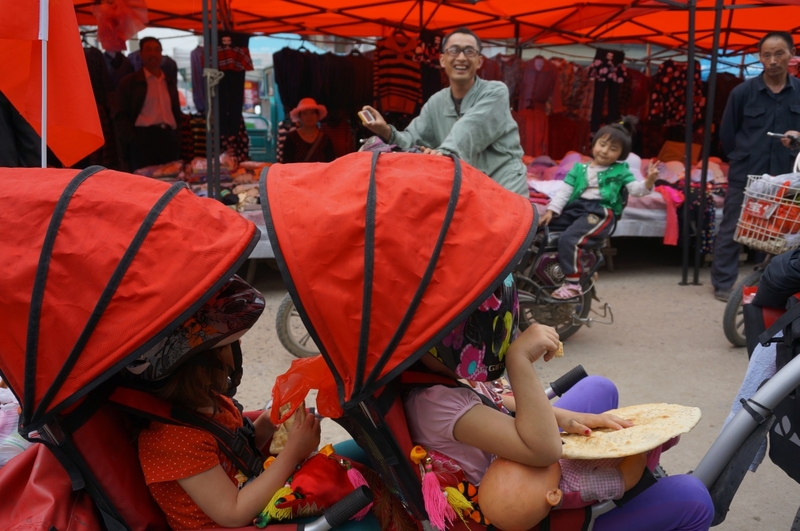 One of those huge, bustling, crowded village markets, where the whole region flocks to sell and buy vegetables, clothes, chicken and pigs, farming tools, pots and pans and plastic utensils. For a while we try to navigate, James Bond style, among the stands, motorbikes and pedestrians, my huge bicycle bell (1950s design) frantically ringing, but we have to give up soon. Luckily, the crowd has locked us right beside a stand with flatbreads – and Sarah and Nora nibble happily on the huge round breads. The day has advanced as we are out of market, out of village, rolling on among fields and mulberry orchards, spirits somewhat lifted. And then the paved road, shown on our navigation, turns into a dirt track. We turn back, and turn right, and then left and then left again, to north, and to east, and to south…The headwind does not fail to change direction with us, and grows stronger with every turn. No people in sight to ask about the way, no villages to make a stop, just endless fields and wind. I no longer ask in what direction we go, just turn resigned the pedals, while indignation mounts up. This was supposed to be our time off – not a field-research in Chinese road construction or crop varieties. We deprive the kids of their friends, of their home, we put them through the ordeal of daily travels – and all for what? To show them these dilapidated country roads? I am ready to get off, take the children and hitchhike our way to Tai’an – but what could one hitchhike among the fields with not a single vehicle in sight? Luckily, Volker relies more on intuition than on the navigation, almost useless in the Shandong countryside. As we finally hit the interstate, we are hit by overpowering headwind. Biking feels like pushing against an invisible wall and we turn the pedals simply to prevent moving backwards. The nearest town of Ziyao, with our brunch soups and ice-cream and potential accommodation is 30 km away – an impossible distance in these conditions. Suddenly a white house emerges beside the road, advertising in faded characters Food and Board. The elderly owner ushers us into the front room with concrete floor, a single table and a poster of Chairman Xi Jingping and the First Lady on the wall, and engulfs us in hospitability. Sarah and Nora each get an apple, a cookie, and are shown to a side room – the playground of the lady’s grandson, who is right now in Kindergarten. In the meantime the good lady disappears to the back and soon we are served huge bowls overflowing with noodles and vegetables – enough to feed us for breakfast, lunch and dinner. When it finally seems that the day turns for better, a thunderstorm breaks out. A friend of our hostess joins us, and the two ladies sit at the threshold, nibbling soya beans, watching the rain pouring down and occasionally breaking into song. We sit and watch the rain with them, succumbing to the monotony of the afternoon, strength draining away. The time advances, but the rain does not ease. Around 4 o’clock we manage to muster the remnants of courage – it is either the 30 kilometres in the rain to the nearest town with a hotel, or the bare concrete room next to the chickens. The children rain-overalls are found in the depths of the luggage and we venture into the pouring rain. Sara firmly clutches her baby and for the first time in our journey furiously pedals. The bike splashes through the muddy currents on the road, each passing truck additionally sends muddy showers over us, but the kids, though crusted with dirt, hold on bravely. Apparently, the seriousness of the situation has reached them as well, for the usual whimpering is forgotten. The rest of the journey passes in a blur. 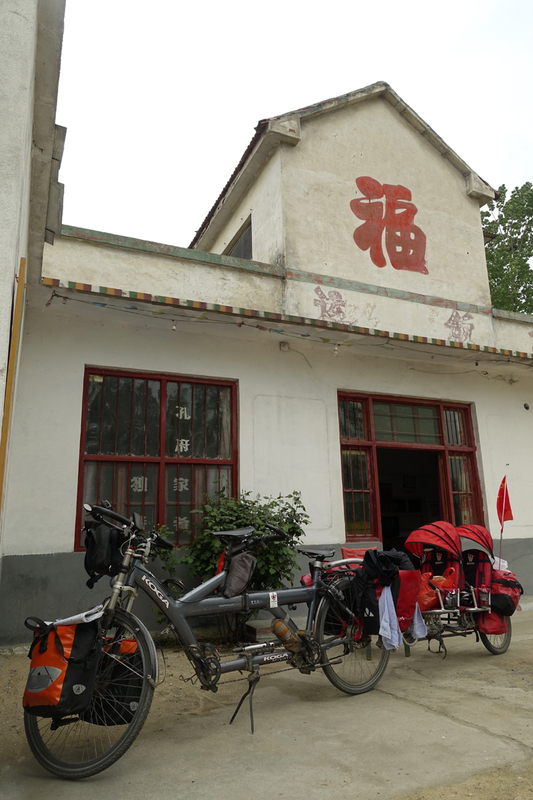 At some time the rain stopped, at some time we turned to a side-road, and at some point shortly before reaching the town we managed to rent a car for the 25 remaining kilometres to Tai’an. I get inside with the kids and luggage, while Volker bravely continues on the side-road in the descending darkness. “How is that road?”- I ask my driver.